I have a fun little technique for you to try. After making a few of these hats I hated how my color changes came out. I came up with what I think is a seamless striping technique and want to share it with you here. 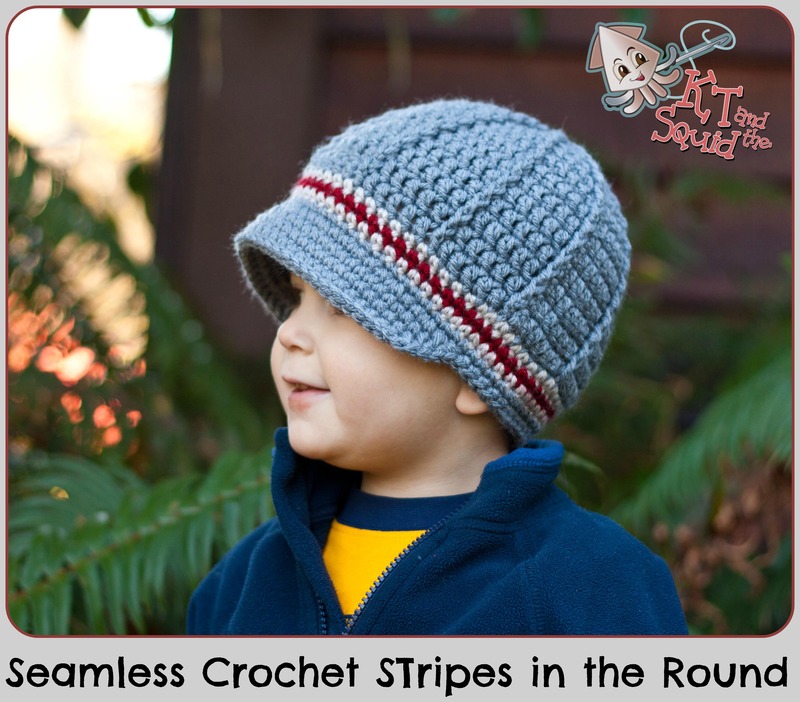 I have written this tutorial specifically to go with The Perfect Stripes Newsboy pictured above but it can be applied to several striped hats (or anything worked in the round) with different stitches as well. To purchase the pattern for The Perfect Stripes Newsboy click on the icon of your choice. Step 1: Work up to the first color change of the pattern. Join with a slip stitch. Try not to pull the slip stitch too tight (you’ll see why soon). Chain 1, fasten off and pull the tail through. It will look like this. Step 3: Pull up a loop of your new color and ch 1. This will NOT count as a stitch but when you are done it will look like a stitch. Note: for this pattern I will be working single crochets however, you can do this for hdc, dc, tr…whatever you’d like. For hdc ch 1, for dc ch 2 and for tr ch 3. Remember the chains will NOT count as a stitch. Step 4: Sc in the first stitch and continue around according to the pattern. When you get to the next color change repeat steps 1-4. This is what it looks like after I have completed three stripes. The seam is below where I have my end hanging out. Pretty good right?